What do you do if you’re a hyperactive kid who can’t sit still? When Bronkar Lee was in 8th grade in Athens, Georgia, his teacher Mrs. Kurtz described him to his mom as a typical ADHD kid. Bronkar, who prefers to use just his first name professionally, channeled his excessive energy into a career as an internationally acclaimed beatboxing juggler who shares his inspirational journey from hyperactive kid to successful entertainer/entrepreneur with audiences of all ages. He’ll perform at 7:30 p.m. on Friday, April 25 as part of Whidbey Island Center for the Arts' ongoing Family Series. Bronkar, now 34, believes that having ADHD is actually a gift. “ADHD is not a negative thing unless you don’t understand what you have and how to find a passion where you can use your excess energy,” said Bronkar. “But one night the headliner was a no-show and I had to improvise so I went onstage and riffed doing vocal percussion with the audience. They loved it, and my new career took off,” said Bronkar. In his stage show, Bronkar uses his voice as an instrument. Beatboxing is actually vocal percussion or mouth drumming, he said. He combines vocal percussion with juggling, using his whole body as an instrument. And in spite of having ADHD, he learned to create structure and discipline around his passion. 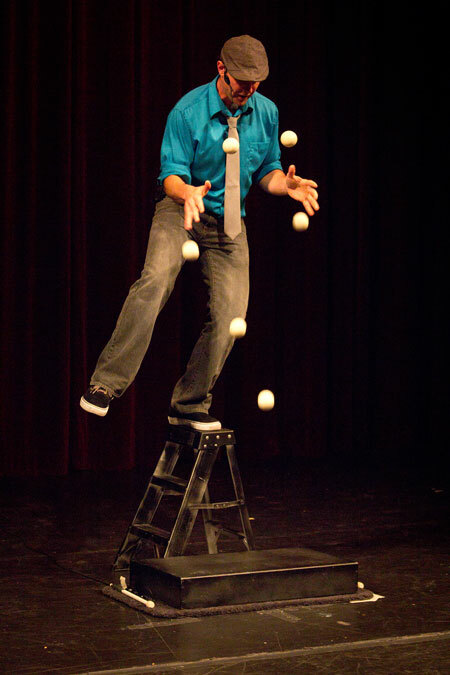 “When I started juggling in my early 20s, I learned from a high level juggler. Now I can keep nine balls going at once,” he said. Bronkar also found structure for his craft with sessions at the San Francisco Clown Conservatory. “I knew I wanted to perform, and to merge drumming, beatboxing and juggling into my performances, but clown school helped me integrate them all into one act,” said Bronkar. That’s the message he imparts when he entertains school groups, such as the Langley Middle School kids he’ll perform for on April 25. He promises his evening show at WICA that night will continue that upbeat message for the whole family. “My show is very interactive and every show is different because every audience is different. I love being in the group energy, facilitating and creating in the moment,” said Bronkar. He said the fulfilling part is how his act affects the people he meets, and by extension, the world. “It’s a gift to me to see people light up and go out and create for themselves,” said Bronkar. Tickets for Bronkar Lee’s Circus of Sound Family Series performance at 7:30 p.m. at WICA on April 25 can be purchased online here, by phone at 360-221-8268 or at the box office open Wednesday through Saturday from 1 to 6 p.m. and two hours before every show at 565 Camano Avenue in Langley, WA.